Our rates are up to 50% lower than comparable hotels point. Thanks Vin and the Plush team for being such great hosts:) The house is just as it looks in the pictures. It is very classy and it made our stay very comfortable. The rooms are big and offer great view of the Petronas towers. There are plenty of amenities that are available in the building including a pool, gym and a kids play area. 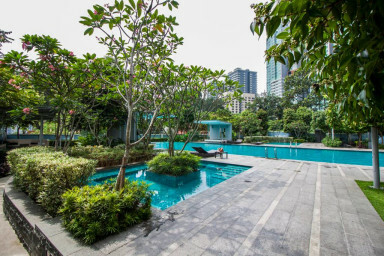 Everything one might need is close from the apartment including public transportation, supermarket, petronas, etc. The check in and check out process is also very smooth. Will definitely stay here again if I revisit Kuala Lumpur. from your second review. Loved staying at this apartment! We comfortably housed 8 people - apartment was very clean, comfortable, with nice view of Patronas towers. Vin left a binder of helpful tips, directions, sample day itineraries. Arranged airport pickup through Vin, as well, which she made easy. Thank you again, we loved the place! from your third review.